Casey Fields. Sounds like a country singer. Country and western, even. Casey Fields. Sounds like a baseball park. A ballpark. Figure. 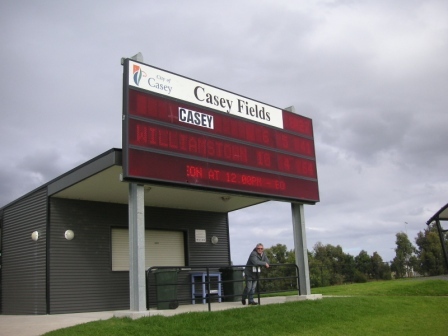 Casey Fields is in Cranbourne, 50 kilometres south-east of the MCG. 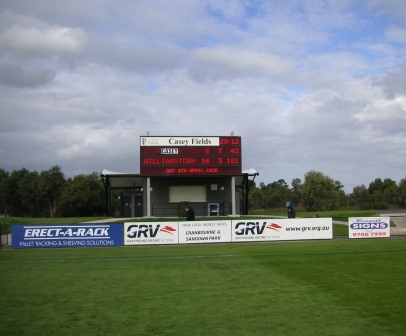 There are a lot fields at Casey Fields and one of them is the home ground of the Casey Scorpions (Springvale Football Club in the old language). The Scorpions are aligned with the Melbourne Demons and are travelling well this year in the VFL. Top of the ladder, or thereabouts. The scoreboard seems easier to read at night than during the day. 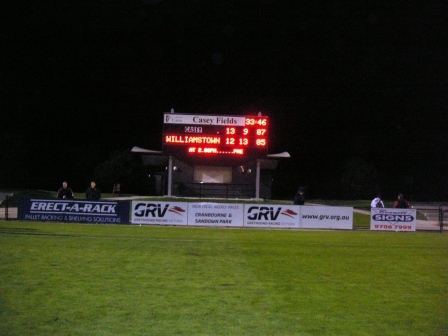 In the score above, from round one, the Scorpions’ seconds got a hammering from Williamstown but, below, the seniors won a tight night game. Casey Fields is part of a growth corridor. Lots of new housing. Are young players – rookies and the like – encouraged to play through the growth corridor? Casey Fields. Sounds like a baseball park. Or a country singer.